FAQ - Them’s the brakes!! Home / FAQ / Them’s the brakes!! The braking system is certainly not the coolest part of your vehicle to look at, or even to build, let alone chat about online or at a Cars-N-Coffee…But it’s definitely one of the most important, if not THE most important system on any vehicle. With a Project like ZedSled, where EVERYTHING has to be replaced or upgraded, it’s nice to know we have options when it comes to saving a little money and still having the safe and reliable braking system we need on a car that’s going to be driven in performance oriented ways…(Translation - beat upon severely and abused) Eastwood knows the importance of reliable brakes, and offers several kits and tools that make creating brake lines or other metal tubing lines in your vehicle easy and affordable… So Thanks Eastwood! The cones at the autocross thank you, the pedestrians and the crosswalk than you, and the Racoon in the highway that freezes in my headlights thanks you as well! 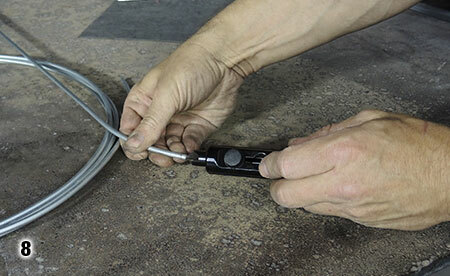 Here’s how to fab brake lines, and do the job right! 1. 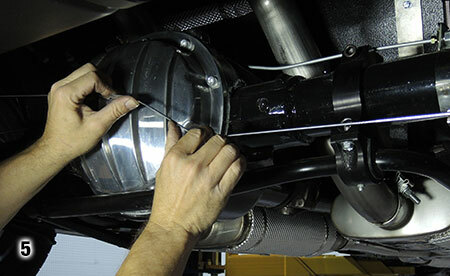 The Eastwood Steel line tubing kit #49053 comes with a roll of tubing (ours was 3/16”) and 16 NPT fittings in various sizes, giving us the ability to plumb a complete brake system in almost any vehicle. 2. 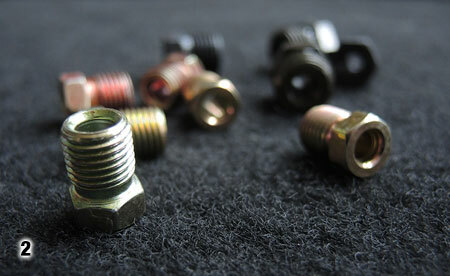 The tubing nuts come pre-threaded and to fit standard 45° double flare line systems. 3. 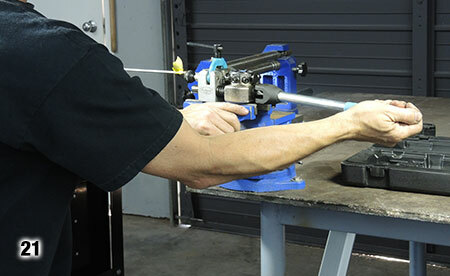 Another cool and affordable tool is the line straightener…These are available from 3/16” to 5/8” sizes as well as metric sizes…ours is of course 3/16” to match the tubing roll. 4. 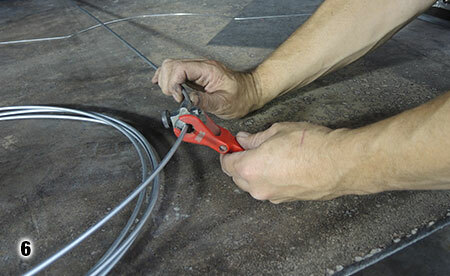 The first order of business is to straighten out the coil of tubing, which is easy and actually kinda fun!! 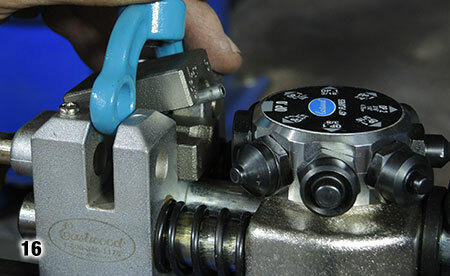 Gone are the days of manually trying to straighten out a roll of tubing, and risking kinks, which restrict flow…Well worth the tool purchase!! 5. ZedSleds rear brake circuit was remade to mimic the factory one, We fabbed the replacement by using a section of aluminum TIG wire to create a template to use as a guide to bend the sections of lines. 6. 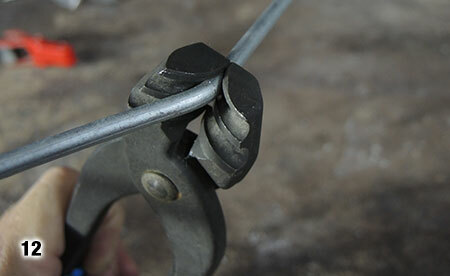 We cut a section of tubing based on our template…a ratcheting line cutter is a nice option here!! 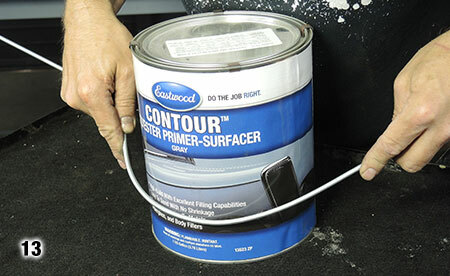 It also makes cuts while lines are on the vehicle much easier of you’re doing a repair. 7. 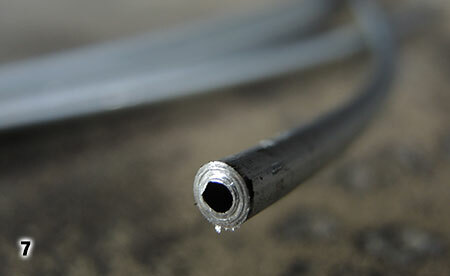 Here’s a closeup of the tubing after the cut. 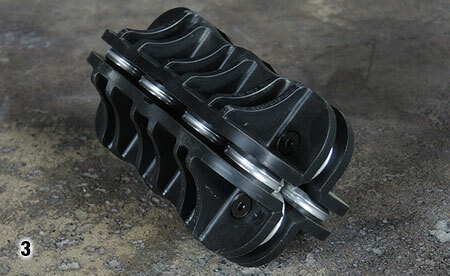 This is a restriction of flow, and the shards can get introduced into the brake system if not cleaned out. 8. 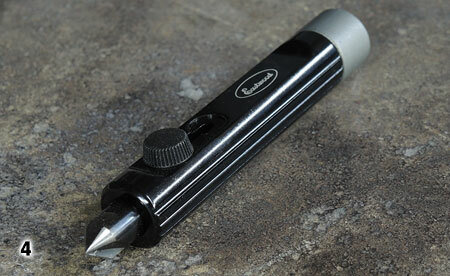 The Deburring tool #30448 does a great job of cleaning up these areas. 9. You can see the difference in the unrestricted opening! 10. Using an ink marker, draw a line on one side of your tubing…this helps you see the “plane” of the piece, and helps keep you from twisting your design accidentally. 11. 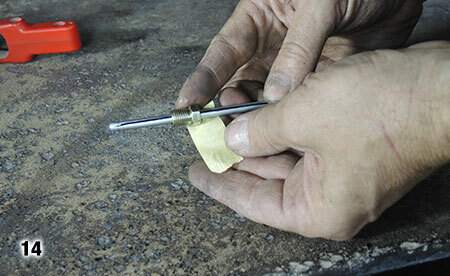 Using the tubing bender & forming pliars kit #13621 the first bend is carefully pulled using the template as a guide. 12. 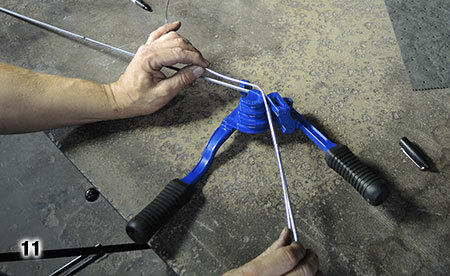 The forming pliers make it easy to make small adjustments or radius bends, without the fear of kinks that will restrict flow. 13. To make a large radius, kinks are not such a concern, but a smooth curve is… A Gallon can and an easy touch gets the job done. 14. 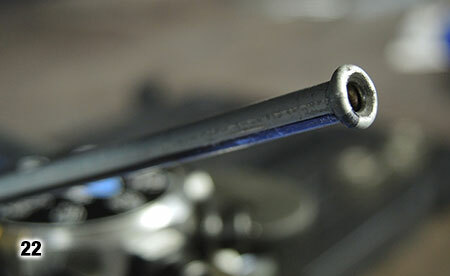 With the section bent…Don’t forget to put your tubing nuts on BEFORE flaring the ends… Trust me it can happen! 15. 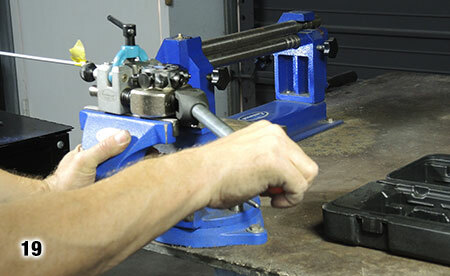 The Pro Brake Tubing flaring tool #25304 is the best flaring system on the market… We’re using the 3/16” Die that comes with the kit, and using the double flare end. 16. 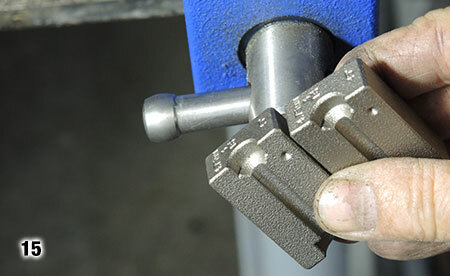 The first step is to insert your tubing into the die, and clamp down the die to the machine. 17. 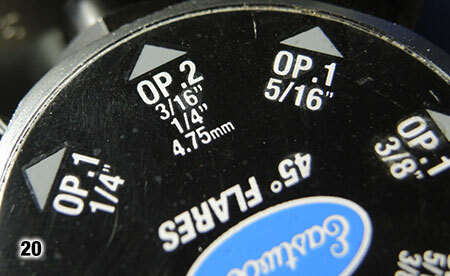 OP0 is simply to even the tubing to the end of the die at the correct depth. 18. It’s as simple as reading the steps on the top of the flare set...OP1 3/16” is step one. 19. 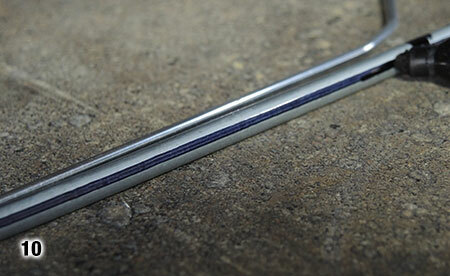 Using a firm but controlled pull you’ll actually feel the metal “give” and relax… this completes the first half of a double flare, which is necessary on carbon steel tubing. 20. OP2 is dialed in on the machine. 21. 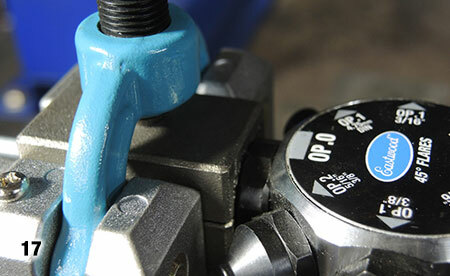 Again, using easy but firm force, you’ll feel the flare take form… The beauty of this machine is that you actually feel the metal responding, making it much more accurate than the more expensive pneumatic flaring tools. 22. 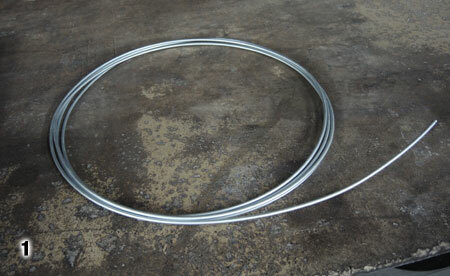 This is a PERFECT double flare, no splits, no misalignment, simply perfect. 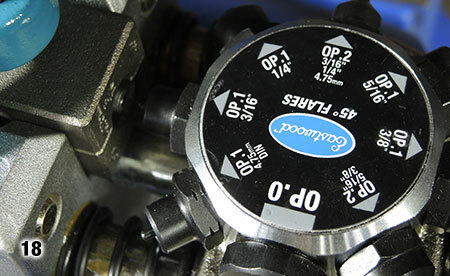 Creating your vehicles brake circuits will take time, but its time well spent! 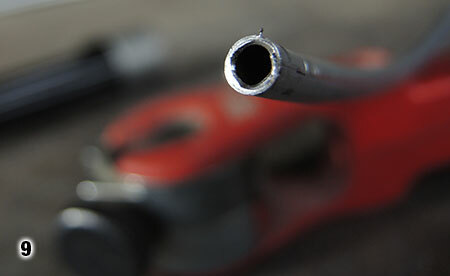 DIY is not just about saving money, although these tools will definitely help you do that! DIY is about having the control over important aspects of your build. I have TOTAL confidence that my homemade brake line system on ZedSled will not fail at the junctions that I’ve made, and that means a lot. We put a lot of trust into our vehicles, and it’s nice to know that Eastwood provides a way to have a great layer of security in a high performance build!!! See you on the autocross course! !